I'm excited to announce our next Ewe Ewe KAL! 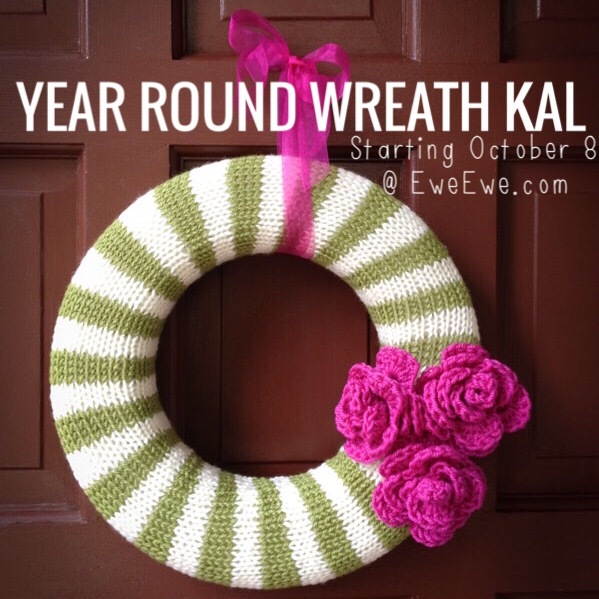 The Year Round Wreath is a fun pattern that mixes simple knitting and crochet. The wreath is knit like a scarf and the three flowers are crocheted in a contrasting color. Think of the fun possibilities with this cute project! You could make a Halloween wreath with orange and black stripes with silver flowers. Or what about a patriotic wreath with red and white stripes with blue flowers. It only takes one ball of Wooly Worsted in each color! Think it over while I give you the rest of the details. Some techniques you'll learn in this knit along are skills like carrying colors for stripes, mattress stitch for making a tidy seam and the steps of how to crochet a flower. You should know how to knit, purl and make the basic crochet stitches such as chain and single crochet. Day 1: October 8 cast on! We'll learn stripes and work on the wreath. Day 2: October 13 seaming! Get that wreath assembled. Day 3: October 15 flowers! Learn to make the cute accent flowers. Day 4: October 20 brag post! Show off your finished wreath! Make the Year Round Wreath in colors that coordinate with how you like to decorate! We put together 10 kit ideas as inspiration. What works with your home? Does your mom need a new wreath? There's so many fun choices! You can choose one of our kits or design your own combination with our fun palette of colors. Find a Ewe Ewe yarn store near you! If you don't have a shop near you, you can check out KAL kits here and regular Wooly Worsted yarn here. To follow along you'll want to come back to this blog to see the newest posts. On social media use the hashtag #YearRoundKAL and follow us on Instagram, twitter and Facebook.